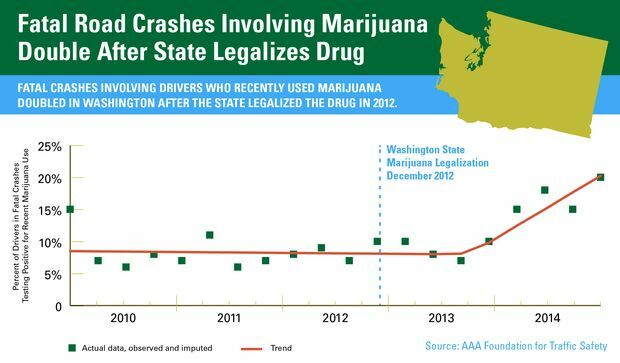 Fatal crashes involving drivers who recently used marijuana doubled in Washington after the state legalized the drug, according to the latest research by the AAA Foundation for Traffic Safety. New research also shows that legal limits for marijuana and driving are arbitrary and unsupported by science, which could result in unsafe motorists going free and others being wrongfully convicted for impaired driving. Washington was one of the first two states to legalize the recreational use of marijuana, and these findings raise serious concerns about drug-impaired driving with at least 20 states considering marijuana legalization this year. Road safety blew a sigh of relief earlier this year as marijuana legalization legislation was defeated in Vermont and New Hampshire, however Maine voters will go to the ballot in November and decide whether to pass legalization. This year Maine lawmakers also defeated a bill that would have set a arbitrary legal limit for THC at 5 nanograms, the same as in Colorado and Washington, where recreational marijuana use is legal. On May 16th, AAA Northern New England and the Maine Bureau of Highway Safety will be hosting an Impaired Driving Summit in Portland to tackle the issue of drugged driving and address these recent findings.